This is a sweet little book that had all of us laughing and smiling and begging for more. 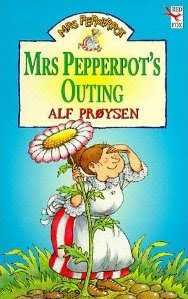 I'd actually never seen or heard of Mrs Pepperpot before. This book was a hand me down from Grandma and one we really enjoyed very much. Mrs Pepperpot is a funny old lady that shrinks, without warning, even to her, down to the size of a pepperpot. Whilst shrunk she has the ability to converse with animals. During her outing she meets animals that are treated poorly by their owners and she does her best to take them under her wing. This story is short enough to read in just a couple of sittings. K drew the main characters from the story with pastels. B had a case of perfectionism with this one. With every animal he attempted to draw he couldn't get it right. They all looked 'right' to me, but not to him and so in the end he just asked for a colouring page. Do you think I could find a colouring page anywhere online, no way. The illustrations inside the book are mainly line sketches so I decided to just take a copy of one of the pages. Being quite an old book the pages are yellowed but apart from that it worked perfectly.